Masterpiece is our another Free Blogger Template,with a Clean and Minimalist Look , Simple yet elegant blogger themes that will keep your visitors intrigued the minute they land up on your site, This Template is created for the people who loves to share their stories, writing blogs about Fashion, Décor, Lifestyle and many more. 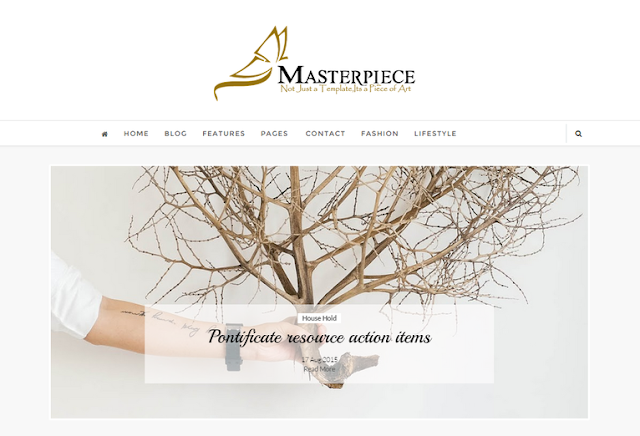 MASTERPIECE is a clean and Light Weight blogger template that gets rendered very fast and it is a Responsive Blogger Template optimized for all Devices from mobile phones to tablets and from laptops to other big screens. Masterpiece is very flexible, easy to customize template and it is very well documented, which will help you to get familiar with all the tweaks needed while installation of this free blogger template. It is an easy-to-use blogger template, a perfect match for Fashion/Beauty Bloggers, Personal Bloggers, Content Providers, and Simple Creative Magazines etc., who need a beautiful yet powerful platform to showcase their work. To take your blog to next level it's really important to have a welcoming and a fuss free layout, which is exactly what this theme delivers. THAT’S WHY WE CALL IT “NOT JUST A TEMPLATE, IT’S A PIECE OF ART”. This template comes with three beautiful styles: Masterpiece- with slider, Masterpiece- with Carousel, Masterpiece- with standard Post. All Our Blogger Templates Comes In Two Versions(Premium and Free), Premium Versions Are The Paid Version Which are Fully customizable with No Encrypted Code whereas Free Versions Are The Trial Version they do have Encrypted Code and Some Restrictions, But Free Versions Are the Best Way to Check how Your Blog Will Look After Installation Of the Template. Not That Tech Savvy..?? Try Our Template Installation Service: If you are not that tech savvy and don’t have much experience with blogger dashboard and HTML/CSS then you can opt our Blogger Installation Services package that will cost you $20, A good price for hassle free Installation process. Our Tech-Team will handle it and make your blog/site exactly like the demos. Tried to install free version but redirect to yotemplate.com few seconds afterward. I can't even see is the template suitable. I swear I did not remove or even edit anything. Please help to check blogtemplatett.blogspot.com << This is my testing site. Hi, thanks for the help. I tried to install the theme to another blog. No issue on that. I am not sure what's happening. Since it is a testing site, I decided to create another one to do testing. The problem didn't happen in the new test blog. So, I just deleted the previous one and assume problem solved. I cannot get the carousel to display - are there any tips on making this happen? Please check your email inbox, We have send you the solutions for your queries. please read the documentation file to resolve this issue, we have provided a detailed instructions about this. Hii .. Please I have the same problem .. but I didnt understand how can i remove it :( .. I am having an issue with the instagram scroll as well. It worked for the free version but wont work for the paid version. I have downloaded the slider version. But it doesn't work. How to make it work? Please Check your mail, we have send you the solutions and instructions to resolve this issue. Hello, I didn't receive any email from Yo Templates, checked including spam mail. Please send again: sinyee.yong@gmail.com. 2) Find the gadget called "SLIDE1" + click "edit"
4) For any blog post you want the slider to display, go back to it and edit the Labels, making sure you include the same word from step 3 as a Label. 5) Your slider should now display any blog posts which have your chosen word in its Labels section. where the slider must placed in layout? Hi! May I ask you a question? Do you know what can I do to display only one photo from the post in the homepage? Please share your blog's URL here or through mail, So that we can help you with a more detailed solutions. HI! I'm installing the free version but I wonder If it's possible to change the "continue reading" text 'cause I need it in Spanish. If somebody knows how to change it, please tell me !! First of all, Thank You for using our template, We are really glad that you liked our work.If You are using a free version, It would not be possible for you to change the "continue reading" Text as free versions comes with some encrypted codes and restrictions. i did not enjoy a good customer service from you. I asked you a question with my email : seunbanjo@gmail.com over 2 weeks ago, up till now, you did not respond! thats not good for a repeat business u know. My issue with your Masterpiece carousel template is that on the slider section below the navigation bar,labels show directly under each images. i dont want the labels to be showing, i just want the image to appear on the slides. Hello, how do I change instagram the slide? I just downloaded the free version of Masterpiece Blogger Template but I am having a problem. Below posts after the share button I still get other share buttons, the image plus name of the girl and some latin words. How to I remove this? Fabulous! it works!! Thanks so much!! For anyone who is having trouble trying to change the About Author bit at the end of each post. Just follow instructions above. How do you change the about me at the bottom of your posts? Please go to blogger dashboard,then click on templates and go to edit html section, here you need to find "author-text" in the code, and change the attributes according to your requirements. Hi, the slider is too big for my blog, how can I change the size? here's my blog www.gotrendymid.blogspot.mx pls email me :( i love your template! I ordered this week the template pack with installation assistance. Didn't have to do anything myself. They made it just as i wanted it. I just had to give my preferences :) Totally love it! And already got a lot of good responses for the new blogdesign. Thank you Yo design for everything. Totally recommend your company!! Hi! I downloaded the free template, but I have some difficulties. How do I put the text about me equal to the demo version? Social networks and Carousel part also could not include. I wonder how I do! Can you help me? Sorry for my bad english. I'm from Brazil. My email: blogfalaseriograzi@gmail.com. Thank you! How to remove the Footer credit since i bought the premium version? Please email me at fanto.chandra@yahoo.com. Thanks. How can I remove the author profile after my blog post? I already unchecked it on the layout but it's still there. Plus, the profile is from your sample template. Hi, I'm interested in buying this template but I need a third level menu for my blog and I can see only a second level menu on this template demo. It's possible to easy add a third level menu?. Thank You very much. i'm interested in master piece free template, but i have a question; the image ofthe post are too big and in all the post are present more images , i'd like to have only one image of the post as a thumbnail slightly bigger, is it possibile with a customization? is it possible in not free version? did you get any answer? I'm asking the same ahah. Thanks Linda. Great tip and managed to change image size within each post based on the " auto" coding. However I can't seem to find the line for the code on which to change the image sizes for the main Home page which usually displays 1 - 4 of the most recent posts before readers click on each to " Continue Reading". Need to downsize those pic sizes. Hope you can help. Changed the 'instagram_list' user ID and access token but it didn't change anything.... please help! Look for the script twice and add your own. Another great tip and guide. Managed to change the UserId and Access Token as you had described and it is now working for the feed slider at the footer for IG. YOu are such a great help! Hello! I love the template, but can not figure out to change the author profile that appears at the end of each blog post. Please help!! Can anyone please help assist me on exactly where in the html is the author box to edit.. I been looking for a few hours. Also sent email in regards to assistance. I searched for all things in prior thread and have found nothing. Hi. I just downloaded this theme and I'm having some trouble with the size of images on the front page. Is there any way to make them smaller? They seem to be stretching which is making them blurred and huge! I've tried changing the image size in the blog post but nothing happens and I've tried looking for the HTML stuff but I'm not that great with understanding it all. Any help would be appreciated! is there a way of putting the title of the posts BEFORE the image? And how to turn off fotorama? Hi! Everything is working great except I cant get the Slide to work. The Slide1 widget wasn't there when I uploaded the template. Please help! Hi there, I have added number and bullet list into the blog post and I discovered that the spacing between the normal paragraph and the bullet list is different. How do I make it the same ? Also, it is not showing the "number" or "bullet" in the post, how can I make it visible ? Hello, is anyone there to answer the above questions ?? how to remove continue reading and show the full post? There are multiple authors contributing in my blog, how you set different author profiles at the end of each article that differs whenever an a certain author writes a certain article? Hi! I have a question. How I can change information about author in the template? I want to write some information about me but I haven't idea how. HI! I'm installing the free version buti cannot get de slide1 to display. how to have the instructions for personalize the template ;HTML codes... ?